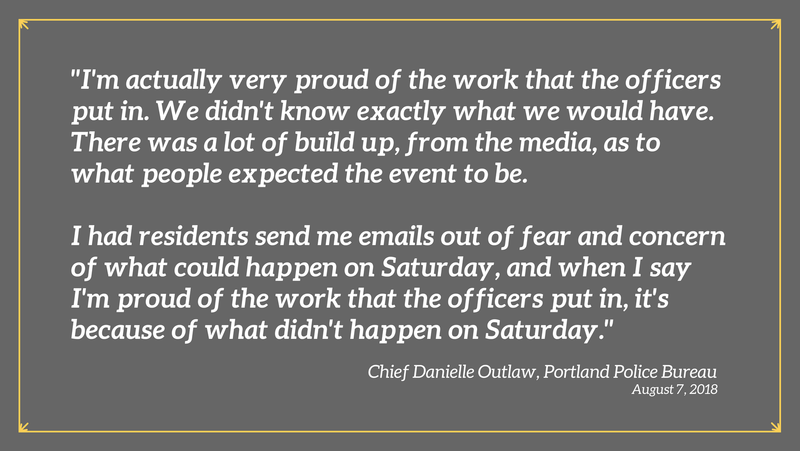 Like many Portlanders and Oregonians, I anticipated that last Saturday’s protest in Waterfront Park would become a more dangerous and volatile situation than it did. I’m thankful that our officers were there to maintain general public safety and, to the degree possible, provide a safe venue for those who truly sought to peacefully protest. Growing up in the 1960s I remember watching the peaceful protest marches led by Martin Luther King Jr. Although Dr. King’s safety was constantly in danger, not once did you see Dr. King hiding his face with a bandana or mask. Not once did you see Dr. King wearing a ballistic vest or helmet during a protest. And never did you see Dr. King throwing rocks, bricks, or bottles at police and destroying property during his peaceful protest. Through his peaceful approach, Dr. King made his point and the world followed. Much of what we saw last weekend on our waterfront was far from Dr. King’s peaceful approach to fighting back hate. I deplore the thought of hate speech and racist rhetoric openly advertised on the streets of Portland. However, we are sworn to protect the Constitution of the United States. What we saw on Saturday was violent behavior. And it was that behavior that prompted police action—and rightly so. Portlanders are tired of having their public safety jeopardized by groups of people that seek to use violence to get their point across. Portlanders are tired of hundreds of thousands of their hard-earned tax dollars going towards the cleanup of rocks, bottles, bricks, and bottles with hazardous fluids thrown by some protesters during what is billed as a peaceful protest. Portlanders are tired of the national reputation of being called the civil disobedience center of America when violence is the tool of choice by protestors. To those officers who endured violent behavior and took prompt action to maintain public safety: thank you. I also want to thank Chief Outlaw for her message supporting the work that the officers put in on Saturday and calling out those individuals who threw rocks, bottles, explosive devices, and bio-hazards. Her comments to local media were informative and explained how those in the crowd who were committing acts of violence dictated our police response. The tactics and strategies used prevented a potentially catastrophic outcome to a situation that grabbed media attention nationwide.